Analyzing a select fraction of all the available data on a closed-end fund may be considered reductive but typically works very well for choosing funds for further consideration. Using simple selection criteria like dividend history and resilience provides a method for quickly testing a CEF for future investment. Developing a personal strategy based on a simplified selection process instead of examining each fund’s sector or category merits eases the process of identifying new investment opportunities. At the end of the 19th century, the Italian economist Vilfredo Pareto noted that 80% of Italy's wealth belonged to only 20% of the population. This observation lead to what is now known as the Pareto Principle: in most situations, 80% of effects flow from only 20% of the potential causes. In other words, the effect (output or reward) of an action is not necessarily proportional to the cause (input or the amount of effort exerted). For example, in the case of business management, it is axiomatic that 80% of sales come from just 20% of clients. Similarly, it is often true that 80% of the useful information in a book can be found on 20% or fewer of its pages. Whether or not one believes that the Pareto Principle makes sense in the context of investment strategy, the point is always to recognize which activities generate the most useful results and give them appropriate attention to reduce inefficiencies. 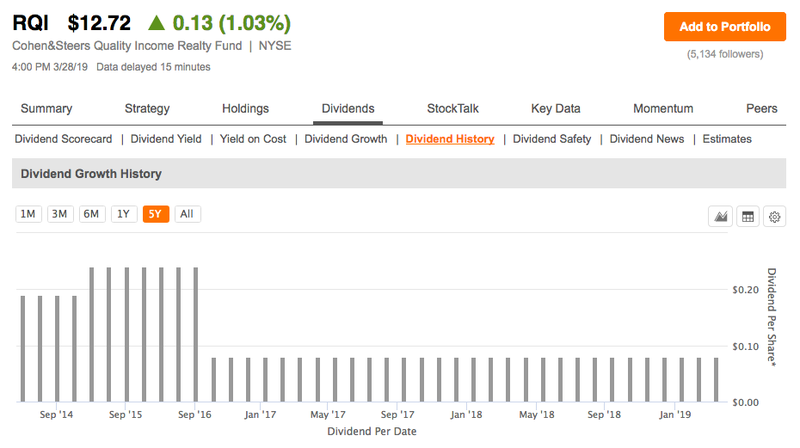 In my first article, "Building A 10% Income Portfolio," I described my personal investing method which is based on the Ockham's Razor principle: "keep your strategy simple." Invest in the best funds with the highest returns and the lowest risk profiles. Accordingly, when evaluating potential investments my primary selection criteria is based on data from Morningstar Risk Rating and RiskGrades. A corollary to my selection strategy is to allocate the time, effort and resources used for making investment decisions according to the Pareto Principle. This helps me focus on what I consider to be the most important 20% of available data when choosing funds for my investments. After an initial skim of the available data for five- or four-star CEFs I am considering, I usually concentrate on two essential parameters: return of capital (ROC) and distribution cuts. Years ago I used this combined strategy to select the seven closed-end funds (CEFS) currently in my portfolio: DoubleLine Income Solutions (DSL), Eagle Point Credit Company (ECC), Guggenheim Credit Allocation (GGM), Guggenheim Strategic Opportunities (GOF), NexPoint Strategic Opportunities (NHF), Pimco Dynamic Income (PDI), Pimco Corporate & Income Opportunities (PTY). 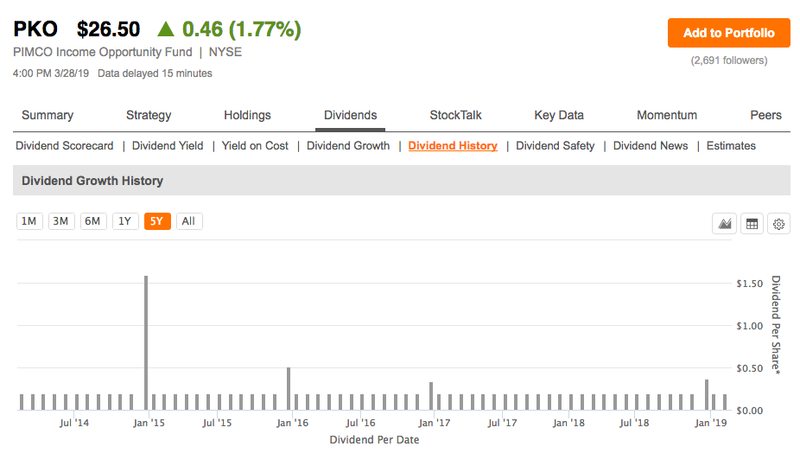 Flaherty&Crumrine is a five-star fund (Morningstar Category: Preferred Stock). Wells Fargo (High Yield Bond), New America (High Yield Bond), Pimco Dynamic (Multisector Bond), Pimco Income (Multisector Bond) and Cohen & Steers (Real Estate) are all four-star funds. AllianGI (Convertibles), the only three-star fund, was recently downgraded from four but is still worth considering. According to Morningstar and Fidelity CEF Screener, of the seven funds listed above, the only fund that had recourse to smallest percentages of return of capital over the past five years is PCI, as shown in the following table. Even though all of the other six funds show a 0.0000 in "Return Cap" column, PCI return of capital has been negligible so far. 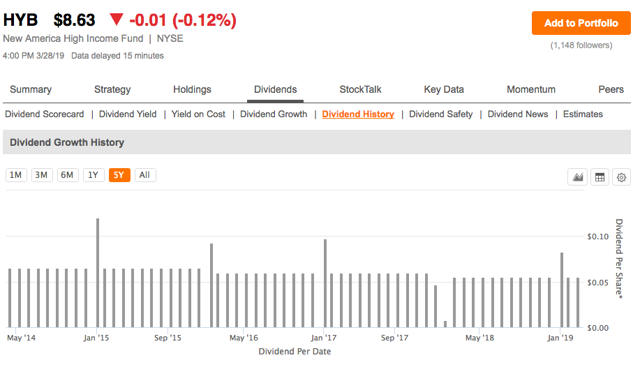 When analyzing a fund which you are considering as an addition to your portfolio on the Seeking Alpha website, the Dividends tab on summary page for the fund provides a link to the Dividend History for the fund since its inception. The lower part of the Dividend History page provides month by month details for the fund. 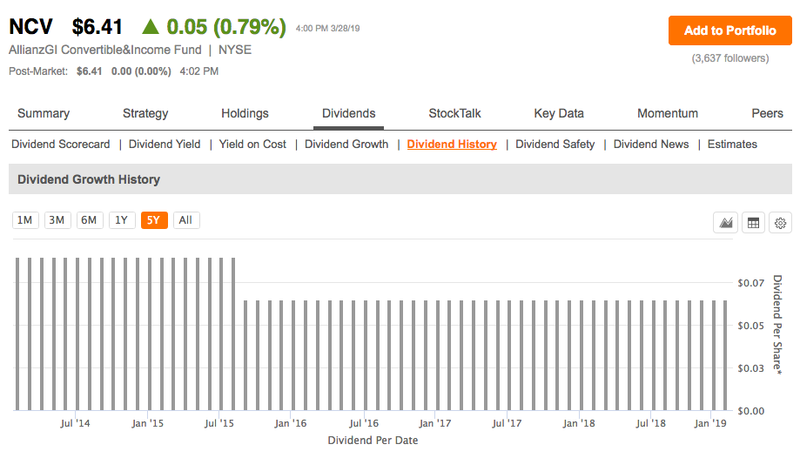 The following charts show the dividend history over the last 5 years chart for the seven funds I am evaluating. EAD shows consistent distributions until January, 2017, then three successive decreases and one increase followed by several months of slightly decreasing distributions. FFC shows consistent distributions until November, 2016, and then four successive decreases (the last in January, 2019). HYB shows consistent distributions until the end of 2015, followed by two decreases in 2016 and 2018. There were four special year-end distributions. NCV shows consistent distributions until August, 2015, then a single decrease followed by three years of consistency. PCI shows consistent distributions until August, 2015, followed by a single slight increase that has remained consistent. There have been three special year-end distributions. PKO shows a consistent distribution for all five years, with four special year-end distributions. RQI shows a single increase at the beginning of 2015 followed by consistent, but lower distributions. 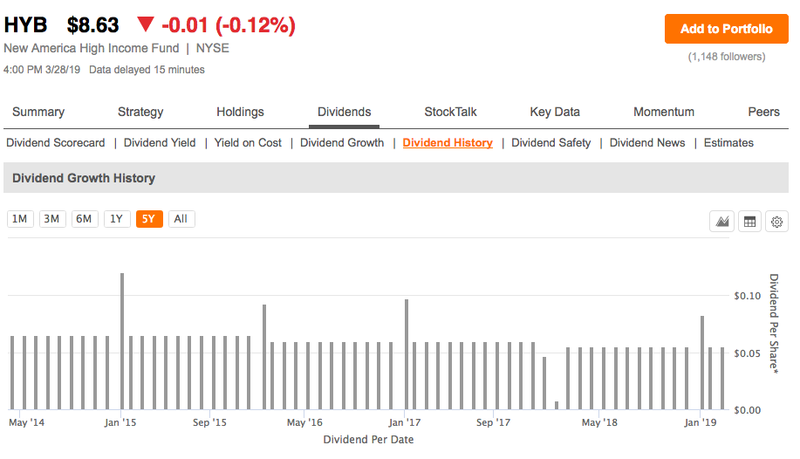 As I described in my previous articles, discounts, premiums and the standard deviation are among the parameters I take into account when choosing CEFs for my portfolio. These parameters provide a measure of volatility by showing how a fund´s total return has fluctuated in the past, typically over the most recent 36 months. The following table compares these parameters for the seven funds I am currently considering. As you can see, NCV and the two Pimco CEFs (like most of Pimco family of funds) trade at a premium; FFC is around the parity; the other four CEFs trade at discount, with EAD and HYB being discounted slightly more than 10%. Comparing the standard deviation for each of the funds we see that it is very low for both Pimco CEFs, moderate for EAD, FFC and HYB, rather high for NCV and definitely higher for RQI. 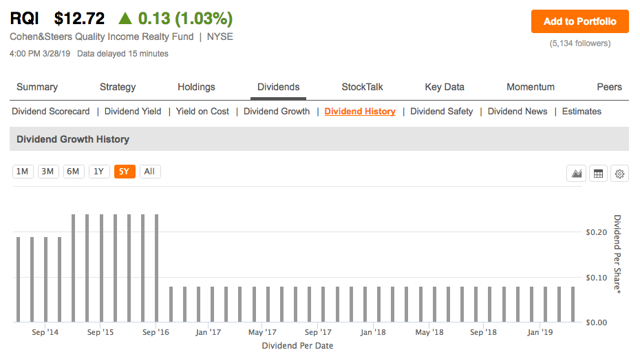 Based on this information we should expect more volatility for the last two funds, NCV (Morningstar Category: Convertibles) and RQI (Real Estate). Considerations of standard deviation lead us to an additional observation regarding funds' resilience during epochal collapses like 2008 global financial crisis. The following charts are useful for understanding how CEFs currently in my portfolio and the others under examination here reacted in during the crisis. Of the seven CEFs currently in my portfolio only GOF, NHF and PTY existed during the crisis. With the exception of PCI, the other CEFs examined in this article were in existence during the crisis. 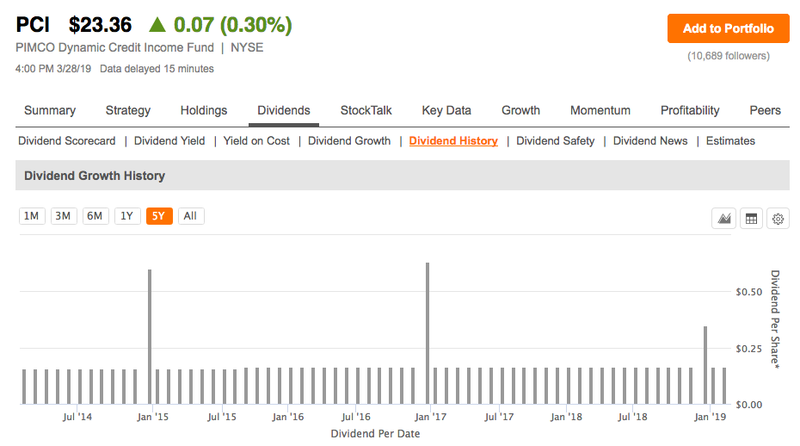 Each chart shows the fund's behavior since inception. With the exception of PKO and PTY, prices and net asset values (NAV) appear to have declined for almost all of the funds, in some cases even dramatically. Of course the reasons for any declines preceding 2008 are not explained by charts. For this reason, we'll only examine the years after 2008, compared to maximum prices and NAVs of each fund in 2007. The reaction of GOF, PKO and PTY, all three Multisector Bond funds, was prompt and recovery was almost complete in less than two years. EAD (High Yield Bond), FFC (Preferred Stock), NCV (Convertibles), NHF (Tactical Allocation) and RQI (Real Estate) suffered more dramatic declines and never completely recovered. The slow recovery raises doubts about the room for the fund managers to maneuver as compared to those of multi-sector bond funds. HYB (High Yield Bond) was only marginally impacted by 2008 crisis. 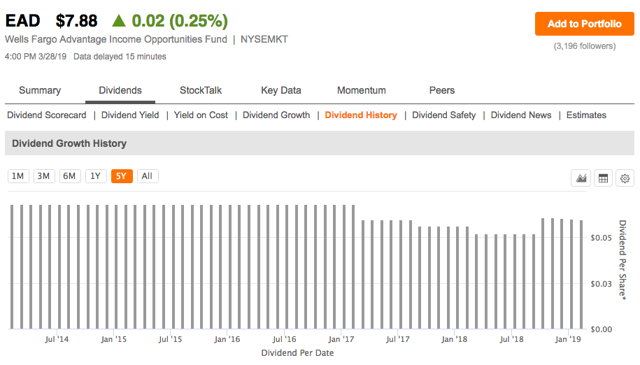 Based on my investment strategy grounded by the Ockham's Razor principle and my adherence to the Pareto Principle, my analysis indicates that PKO is the best new CEF for my portfolio, even though I already hold two other Pimco funds. This is despite the fact that PKO is quoting mostly at premium (eventually waiting for the premium to shrink). The PKO fund launched in 2007 and has a long history of consistent distributions for all of the last five years. 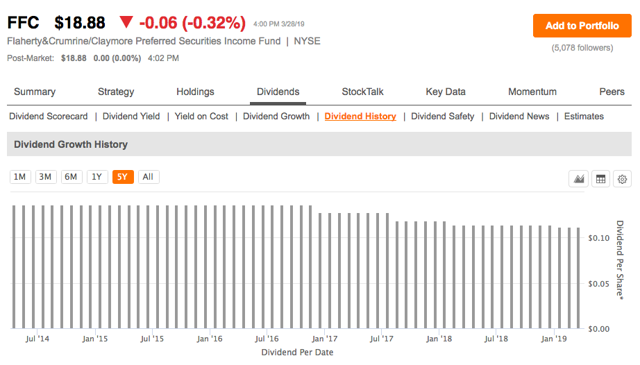 It has had four special year-end distributions, no distribution cuts, a rising NAV since inception, the best standard deviation (4.09) and a financial risk of 64. Moreover, PKO momentum shows a satisfying five year total return and a whopping 10 year total return. While each investor has a personal point of view about the importance of all the different data available for a specific fund and about which data to consider and which to discard, looking for a fund that is satisfying in all respects will surely be disappointing. Each investor must apply their own due diligence procedures before deciding whether to invest in a specific asset class or category and determining what level of exposure that investment represents. The Pareto Principle provides a way to focus on the data that we consider essential when making an investment decision. For my part, I will stick with the data I usually analyze and choose investments that match my criteria. Disclosure: I am/we are long DSL,ECC,GGM,GOF,NHF,PDI,PTY. I wrote this article myself, and it expresses my own opinions. I am not receiving compensation for it (other than from Seeking Alpha). I have no business relationship with any company whose stock is mentioned in this article.